Ahmedabad is the largest city and former capital of Gujarat, which is a state in India. 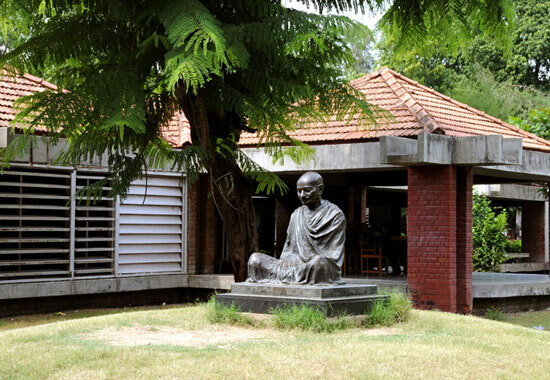 It lies along the Sabarmati River. Ahmedabad is 440 km north of Mumbai. The climate of Ahmedabad is hot and moist. Winters are cool and pleasant (November-February) but summers (April-June) are extremely dry, hot and the temperature can be as high as 46°C at times. The city experiences good rainfall during the monsoon season (July-September). Dwarka is a municipality of Devbhoomi Dwarka district in the state of Gujarat in northwestern India. It is located on the western shore of the Okhamandal Peninsula on the right bank of the Gomti River. In 2011, it had a population of 38,873. 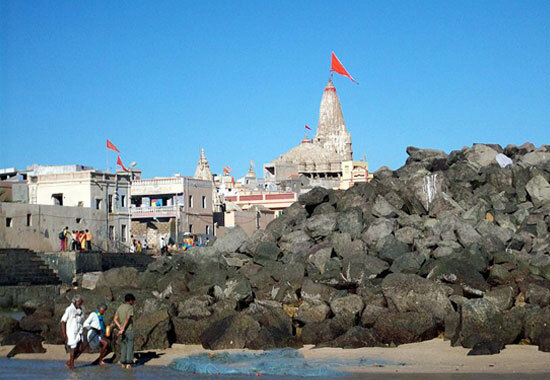 Dwarka is one of the foremost Chardhams, four sacred Hindu pilgrimage sites, and is one of the Sapta Puri, the seven most ancient religious cities in the country. Dwarka is often identified with the Dwarka Kingdom, the ancient kingdom of Krishna, and is believed to have been the first capital of Gujarat. According to the Köppen-Geiger classification, Dwarka has a subtropical desert/low-latitude arid hot climate. The Holdridge life zones system of bio-climatic classification identifies Dwarka in or near the subtropical thorn woodland biome. On the basis of 40 years of climatic data: The average annual rainfall is 310 millimetres (12 in) spread over a rainy period of 29 days with rainfall limited to the months of June to September; the average maximum temperature is 31 °C (88 °F) with a historic maximum of 42 °C (108 °F) and an average minimum temperature of 15 °C (59 °F) with a historic minimum of 5 °C (41 °F); the average annual relative humidity is 72%, with a maximum of 80%. The temple of Dwarkadheesh, also known as Jagat Mandir, is built on the north bank of the Gomti Creek. The temple dates back to 2,500 years. Architecturally the temple is constructed on the same plan and system as most of the Hindu sacred edifices of antiquity. Sixty columns support the roof of the audience hall of the Jagat Mandir. The main temple is five-story high with the lavishly carved conical spire rising to a height of 157 feet. There is the one-meter tall, fourhanded black idol of Ranchhodrai, the ruler of Dwarika. Amongst the large number of temples belonging to different periods in the history of Dwaraka, the most popular with pilgrims is the temple of Rukmini, Lord Krishna's wife, who is considered an incarnation of Lakshmi, the goddess of wealth and beauty. In addition to its temples and legends, Dwarka is also sanctified as the seat of Adi Shankaracharya, who established four seats (maths) in four different directions in the country. Research work in Sanskrit is carried on at the Shankaracharya's seat known as Sharad Peetha. The Gir Forest National Park and Wildlife Sanctuary is a forest and wildlife sanctuary near Talala Gir in Gujarat, India. Established in 1965, with a total area of 1,412 km2 (545 sq mi) (about 258 km2 (100 sq mi) for the fully protected area of the national park and 1,153 km2 (445 sq mi) for the Sanctuary, the park is located 43 km (27 mi) north-east of Somnath, 65 km (40 mi) south-east of Junagadh and 60 km (37 mi) south-west of Amreli. Its ecoregion is that of Kathiawar-Gir dry deciduous forests, which not only includes Kathiawar Peninsula, where the forest is located, but also other places, like Ranthambore National Park in Rajasthan. 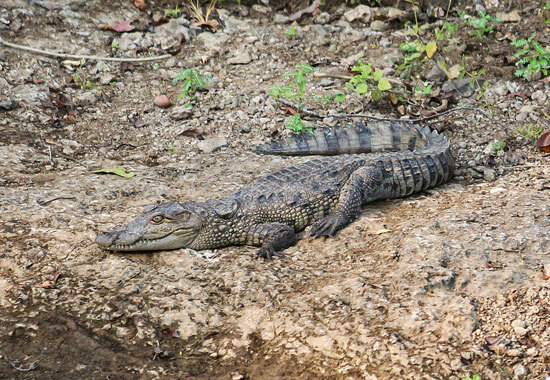 The count of 2,375 distinct fauna species of Gir includes about 38 species of mammals, around 300 species of birds, 37 species of reptiles and more than 2,000 species of insects. The carnivores group mainly comprises Asiatic lions, Indian leopards, Indian cobras, jungle cats, striped hyenas, golden jackals, Indian mongoose, Indian palm civets, and honey badgers. Desert cats and rusty-spotted cats occur but are rarely seen. The main herbivores of Gir are chital, nilgai, sambar, four-horned antelope, chinkara and wild boar. Blackbucks from the surrounding area are sometimes seen in the sanctuary. 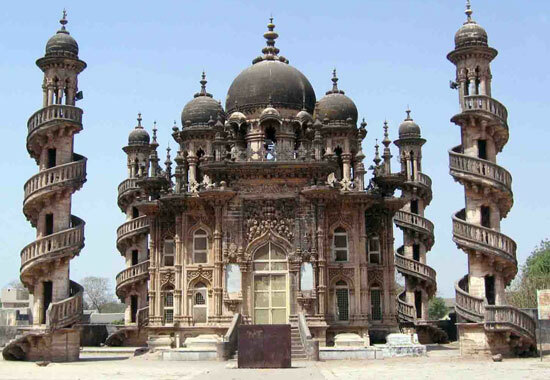 Junagarh is situated in the western state of Gujarat at the foothills of the Girnar Hills. The city extends from latitude 21°31¢ in the North to longitude 70°36¢ in the East. It is an ideal departure point for visiting the Gir forests. The Bhavnath Fair in the month of Magha (January/February) is supposed to be organized first by Lord Krishna to honor the Mahabharata hero, Arjuna. 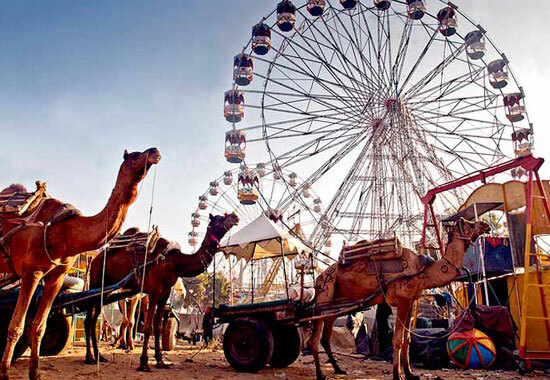 The fair is marked by folk music and dancing and is an ideal platform to enjoy the culture of Saurashtra. 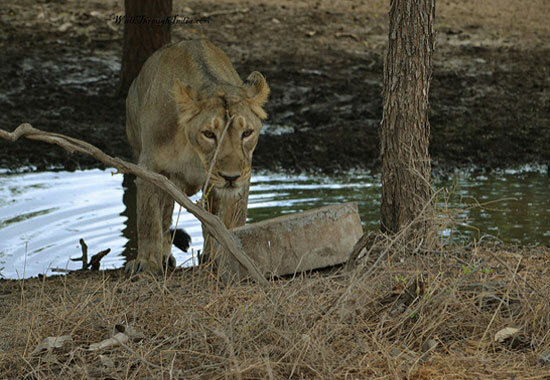 The Gir National Park, situated around 59 km off Junagarh, is the last home of the Asiatic lion. This 1,400 sq km sanctuary was set up to protect the dwindling population of the lions. 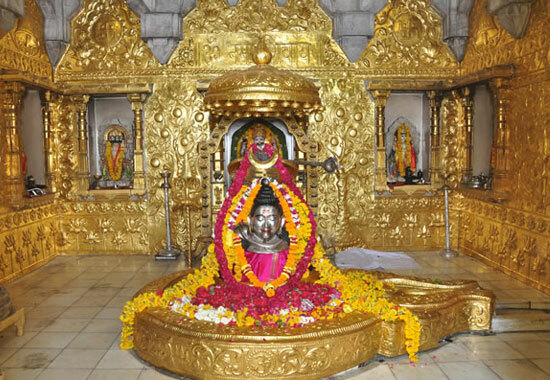 The Somnath temple located in Prabhas Patan near Veraval in Saurashtra on the western coast of Gujarat, India, is believed to be the first among the twelve jyotirlinga shrines of Shiva. 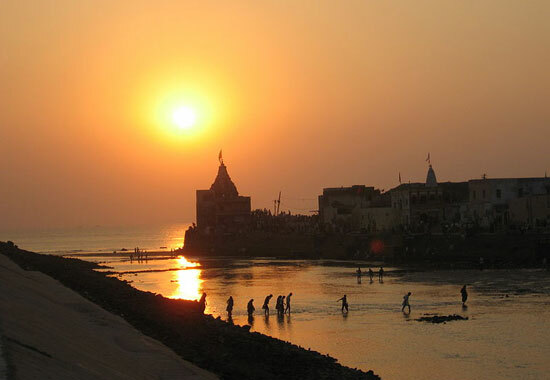 It is an important pilgrimage and tourist spot of Gujarat. Destroyed and reconstructed several times in the past, the present temple was reconstructed in Chalukya style of Hindu temple architecture and completed in May 1951. The reconstruction was envisioned by Vallabhbhai Patel and was completed under K. M. Munshi, the then head of the temple trust. 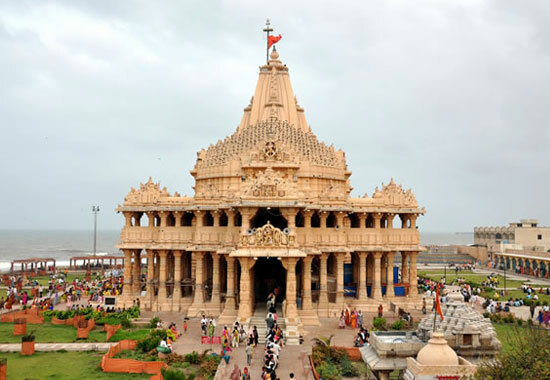 The site of Somnath has been a pilgrimage site from ancient times on account of being a Triveni sangam (the confluence of three rivers — Kapila, Hiran and the mythical Sarasvati). Soma, the Moon god, is believed to have lost his lustre due to a curse, and he bathed in the Sarasvati River at this site to regain it. The result is the waxing and waning of the moon, no doubt an allusion to the waxing and waning of the tides at this sea shore location. The name of the town Prabhas, meaning lustre, as well as the alternative names Someshvar and Somnath arise from this tradition. Ajmer is one of the major cities in the Indian state of Rajasthan and is the centre of the eponymous Ajmer District. 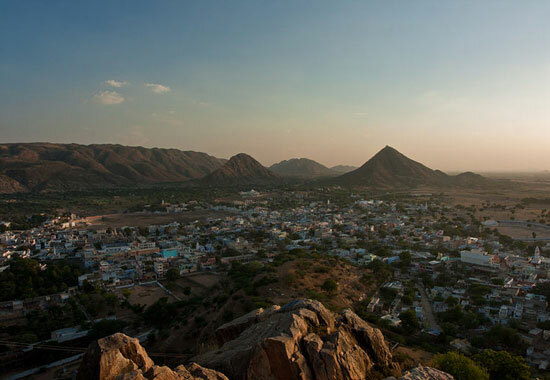 According to the 2011 census, Ajmer has a population of around 551,360 in its urban agglomeration and 542,580 in the city. The city is located at a distance of 135 km from the state capital Jaipur and 391 km from the national capital New Delhi. Ajmer has a hot, semi-arid climate with over 55 centimetres (25.4 in) of rain every year, but most of the rain occurs in the monsoon months, between June and September. Temperatures remain relatively high throughout the year, with the summer months of April to early July having an average daily temperature of about 30 °C (86 °F). During the monsoon there is frequent heavy rain and thunderstorms, but flooding is not a common occurrence. The winter months of November to February are mild and temperate with average temperatures ranging from 15–18 °C (59–64 °F) with little or no humidity. There are, however, occasional cold weather fronts that cause temperatures to fall to near freezing levels. The most important tourist spot of Ajmer is the Dargah or tomb of Sufi Saint Khwaja Moinuddin Chisti. The Ana Sagar Lake and Daulat Bagh are other important sites within the city. Ajmer also has an imposing fort built by Akbar. It also houses the government museum within it. The Nasiyan (Red) Jain Temple built in the 19th century is also worth paying a visit. The best time to visit Ajmer is in winters (November-February). 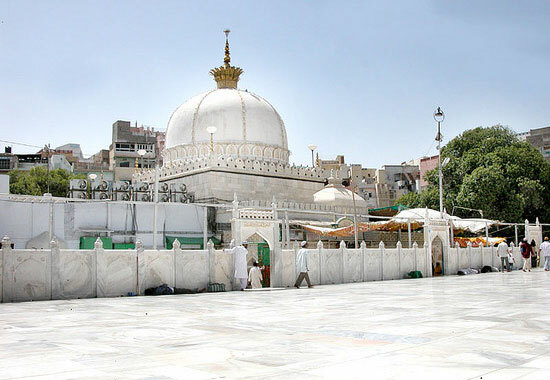 It can also be visited in the seventh month of the lunar calendar every year when the annual Urs festival is held to commemorate the death of the Sufi Saint Khwaja Moinuddin Chisti. Jaisalmer About this sound pronunciation nicknamed "The Golden city", is a city in the Indian state of Rajasthan, located 575 kilometres (357 mi) west of the state capital Jaipur. 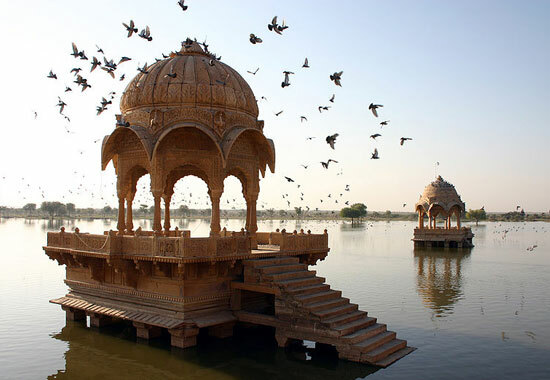 Once known as Jaisalmer state it is a World Heritage Site. This is held over three days in January/February every year. This is the best time to visit Jaisalmer to witness performing arts like Kalbelia dances and folk songs and music. 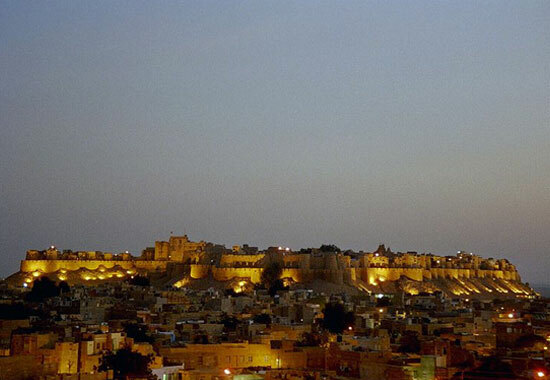 Visiting Jaisalmer itself means a visit to the Jaisalmer Fort. Built over the Trikuta hill, this fort is the biggest and the most beautiful landmark of the city. The fort is occupied by shops, stalls, and a number of other business concerns. This fort accommodates quarter of the city's population. Just outside the fort is the Manakchowk, the famous marketplace of Jaisalmer. It is a good place for bargaining the local products. 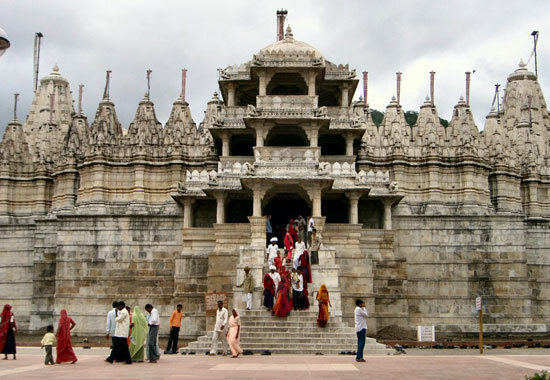 The Jain temple, a place worth visiting, is also situated inside the fort itself. The temple, made between 12th and 15th century, bears testimony to Rajasthan's unique artistry. Jaipur, the capital of Rajasthan state, is often addressed as Pink City and is a part of the Popular Golden Triangle Tour of India. 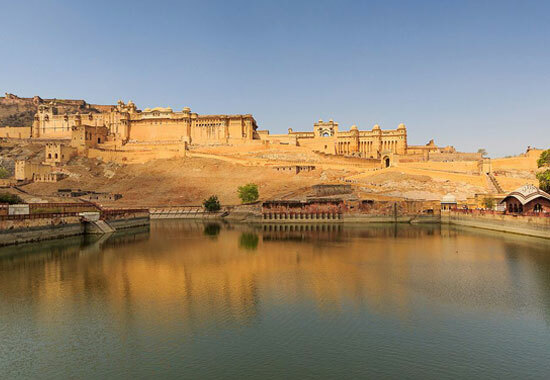 Jaipur, the Pink City and the capital of Rajasthan is adorned with regal forts and palaces. Vibrant culture further ascends the charm. Best time to visit Jaipur is during winter season, i.e. October to March. Monsoon too is a good time to visit Jaipur and you may also get moderate prices in accommodation. Visitor attractions include the Hawa Mahal, Jal Mahal, City Palace, Amer Fort, Jantar Mantar, Nahargarh Fort, Jaigarh Fort, Galtaji, Govind Dev Ji Temple, Garh Ganesh Temple, Sri Kali Temple, Birla Mandir, Sanganeri Gate and the Jaipur Zoo. The Jantar Mantar observatory and Amer Fort are one of the World Heritage Sites. 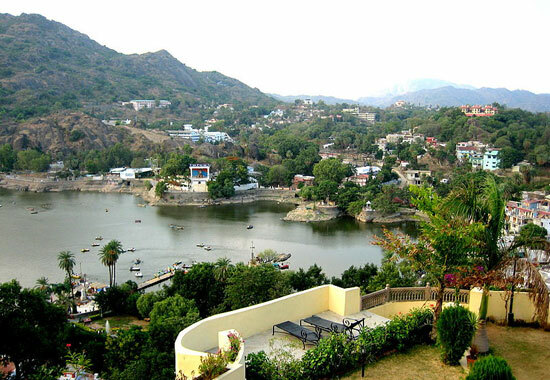 Mount Abu is a popular hill station in the Aravalli Range in Sirohi district of Rajasthan state in western India near the border with Gujarat. The mountain forms a distinct rocky plateau 22 km long by 9 km wide. The highest peak on the mountain is Guru Shikhar at 1,722 m (5,650 ft) above sea level. It is referred to as 'an oasis in the desert' as its heights are home to rivers, lakes, waterfalls and evergreen forests. The nearest train station is Abu Road railway station: 27 km away. Summer prevails from mid-April to mid-June, when the average maximum temperature remains around 36 °C. It is suited for light cotton clothes. Due to its relief and geographical conditions, it rains in Mount Abu during the monsoons. During the rainy season the temperature falls. Normal summer clothing works. It is wise to carry an umbrella to avoid being caught in the rain. Winters are cool in Mount Abu, with mercury hovering around 16 °C to 22 °C. Nights are chilly, and the average night temperature is around 4 to 12 °C. The temperature has dipped to as low as −2 to −3 °C. Heavy winter clothing is preferable. Dilwara Jain Temples : Located at a distance of just 2.5 kilometers from mount Abu, the Dilwara Jain temples were built between the 11th and the 13th century. The feature that makes it a must visit is the amazing and brilliant use of marble in the architecture. The ornamental carvings and the flawless stone laying technique make it one among the most beautiful pilgrimage spots in the world. The temple complex consists of 5 temples which are unique to the Jain culture in India namely Vimal Vasahi, dedicated to the first Jain Tirthankara, Adinath; Luna Vasahi, dedicated to the 22nd Jain Tirthankara, Neminatha; Pithalhar, dedicated to the first Jain Tirthankar, Rishabha; Parshvanath, dedicated to the 23rd Jain Tirthankara, Parshva and Mahavir Swami, dedicated to the last Jain Tirthankara, Mahavira. The lotus like engravings on the ceilings and the different scenes from the Jain and Hindu mythology represented through carved marble sculptures are sure to leave you awestruck. And Other Places of Wildlife Sanctuary, Nakki Lake, Abu Road, Achalgarh etc. Pushkar is a town in the Ajmer district in the Indian state of Rajasthan. It is situated 14 km (8.7 mi) northwest of Ajmer at an average elevation of 510 m (1,670 ft). Pushkar is a city of temples of all sizes, though not as much old or in number as generally claimed. The most famous temple is the Brahma Temple, said to be only one temple dedicated to Brahma in India. 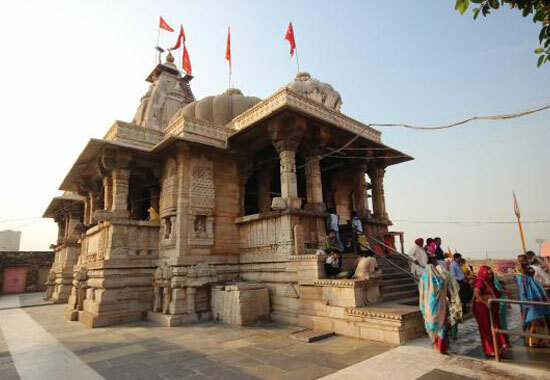 A red spire marks the temple, and over the entrance gateway is the Hans (goose), the symbol of Brahma who is said to have personally chosen Pushkar as his place. Another important temple is that of Savitri (wife of Lord Brahma) on a hilltop. It takes a one-hour trek to reach the temple, but it has a beautiful view of Pushkar Lake in the morning. Other important places to visit in Pushkar are numerous ghats that run down the lake. Udaipur city has particularly a tropical climate. 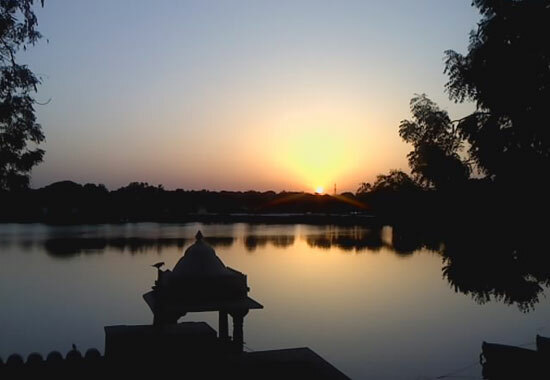 The three main seasons, summer, monsoon and winter respectively, dominate the city of Udaipur. Being located in the desert lands of Rajasthan, the climate and weather of Udaipur is usually hot. The summer season runs from mid-March to June and touches temperature ranging from 23 °C (73 °F) to 44 °C (111 °F) in the months of March to June. Monsoons arrive in the month of July heralded by dust and thunderstorms. With lush greenery and enchanting lakes, the sporadic rainfalls enhance the beauty of the city, making it one of the top monsoon destinations of the country. The winter season prevails from the month of October till the month of March. Humidity, which prevails during monsoons, diminishes at the arrival of winters. The city observes pleasant sunny days and enjoyable cool nights with the temperature ranging from 5 °C (41 °F) to 30 °C (86 °F). 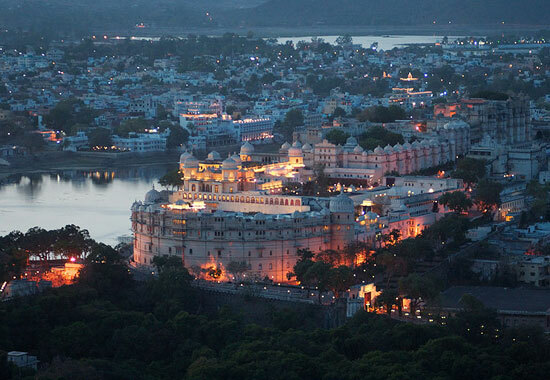 Udaipur's winter climate is the most appealing time to visit. Tourists arrive in large numbers, anytime between mid-September to late March or early April. Even in January, the coldest month, the days are bright, sunny and warm with maximum temperature around 28.3 °C (82.9 °F). Mornings, evenings and nights are cold. If Jaipur is a study in pink, Udaipur is a vision in white. The City of Dawn, surrounded by the ancient Aravali Mountains and set on the edge of three lakes, is a brilliant kaleidoscope of narrow lanes flanked by bright stalls, gardens, lakes, palaces and temples. Overlooking the aquamarine waters of the Lake Pichola stands the shimmering granite and marble Lake Palace, a harmonious arrangement of courtyards, pavilions, terraces, corridors, rooms, and hanging gardens. Eight marble porticos mark the spot where the Mewar sovereigns were weighed in gold, the equivalent value of which was then distributed to the poor. 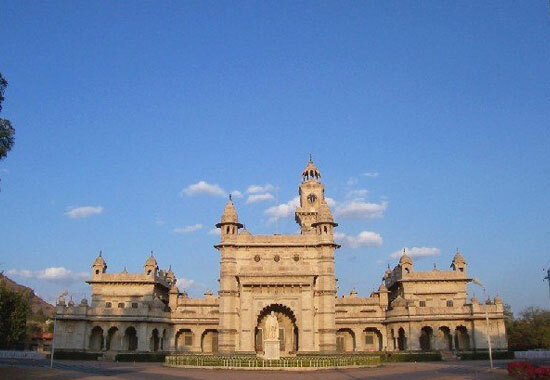 Within the City Palace are several architectural and artistic highlights such as the Mor Chowk, known for its stunning peacock mosaics and the Bhim Vilas Palace that has a series of lovely wall paintings. 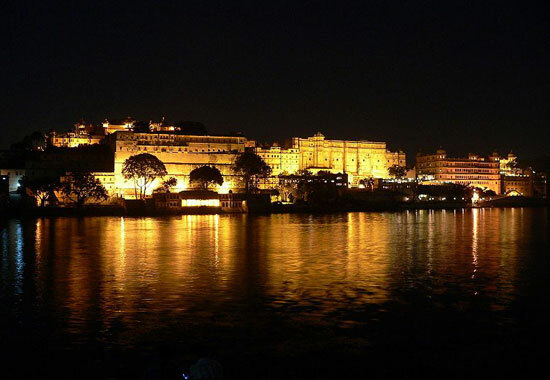 However, the most memorable parts of Udaipur are its lake palaces, shimmering like jewels on the Lake Pichola. Jag Niwas, the summer residence of the princes of Mewar, is today a magnificent luxury hotel. Jag Mandir, the other island palace, with a marble dome, is a marvel in red sandstone. It was a refuge for Prince Khurram (better known as Mughal Emperor Shah Jahan) when he was in exile following a quarrel with his father, Emperor Jahangir. Just outside Udaipur, on a hilltop, lies Sajjangarh, a dramatic 18th century palace that gives a breathtaking view of the Mewar countryside. The palace was originally intended to be a five-story astronomical center, but was later abandoned and used as a monsoon palace and hunting lodge. 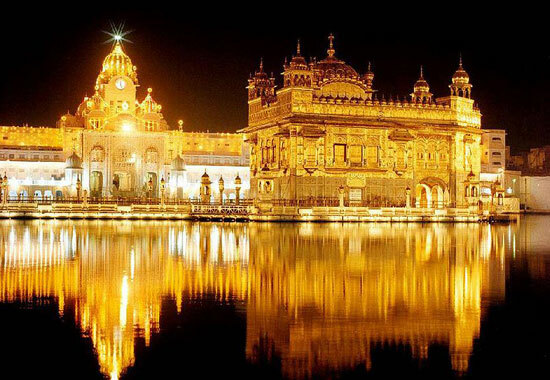 Amritsar (About this sound pronunciation historically also known as Rāmdāspur and colloquially as Ambarsar, is a city in north-western India which is the administrative headquarters of the Amritsar district - located in the Majha region of the Indian state of Punjab. Amritsar has a semiarid climate, typical of Northwestern India and experiences four seasons primarily: winter season (December to March) with temperature ranges from 0 °C (32 °F) to about 15 °C (59 °F), summer season (April to June) where temperatures can reach 42 °C (108 °F), monsoon season (July to September) and post-monsoon season (October to November). Annual rainfall is about 681 millimetres (26.8 in). The lowest recorded temperature is −7.6 °C (18.3 °F), was recorded on 9 December 1996 and the highest temperature, 48.1 °C (118.6 °F), was recorded on 22 May 2013. 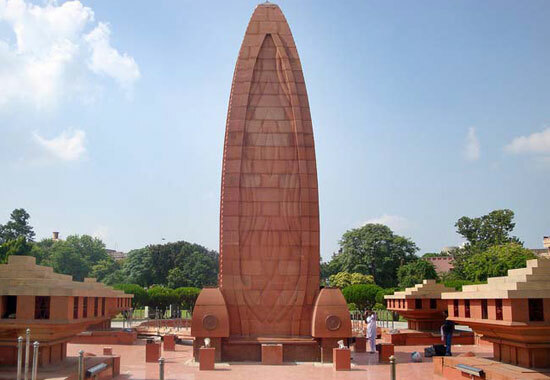 Harmandir Sahib, Gobindgarh Fort, Durgiana Temple, Jallianwala Bagh, Wagah Border, Mata Lal Devi Temple, Model Town Temple, Sadda Pind Heritage Village, Punjab State War Heroes Memorial, Urban Haat Food Street, Anand Garden, Harike Wetland etc. Bikaner is a city in the northwest of the state of Rajasthan in northern India. It is located 330 kilometres (205 mi) northwest of the state capital, Jaipur. 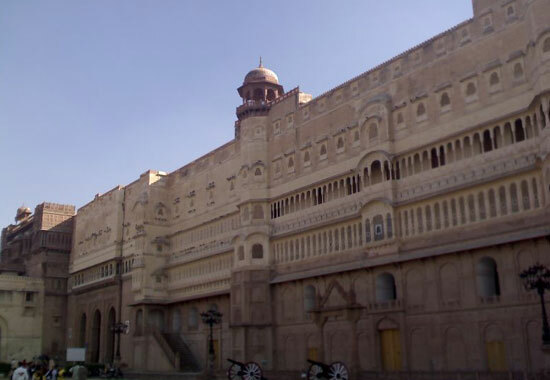 Bikaner city is the administrative headquarters of Bikaner District and Bikaner division. Bikaner is situated in the middle of the Thar desert and has a hot semi-arid climate with very little rainfall and extreme temperatures. In summer temperatures can exceed 45 °C, and during the winter they may dip below freezing. The climate in Bikaner is characterised by significant variations in temperature. In the summer season it is very hot when the temperatures lie in the range of 28–50.5 °C (82.4–122.9 °F). In the winter, it is fairly cold with temperatures lying in the range of 5–23.2 °C (41.0–73.8 °F). Annual rainfall is in the range of 260–440 millimetres (10–17 in). The best time to visit Bikaner is from the months of October through March. Junagarh fort was built by a Mughal army general, Raja Rai Singh, in 1593. The courtyard of the fort along with the balcony, kiosks and windows are perfect examples of the artisanship of that time. The beautiful cutworks and dots on the red stones and the marbles are fascinating. The various parts of the palace-the Dewan-iI-khas, the Phool Mahal, Hawa Mahal, Badal Mahal and Anup Mahal-reflect the glorious architecture of Bikaner. 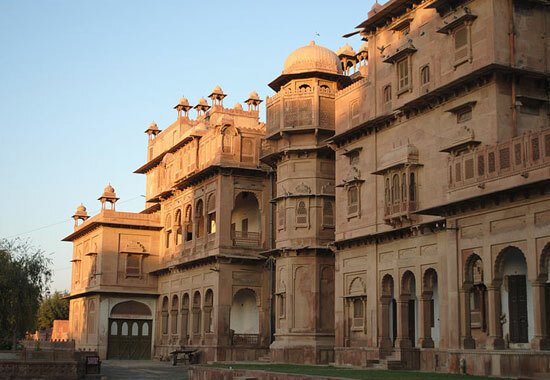 Lalgarh Palace, built by Maharaja Ganaga Singh in memory of his father, is situated 3 km north of Bikaner city. 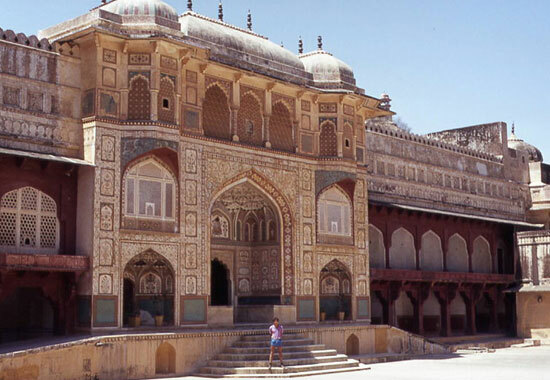 The Rajasthan Tourism Development Corporation as part of their tourism promotion program has converted some portions of the palace to tourist hotels. 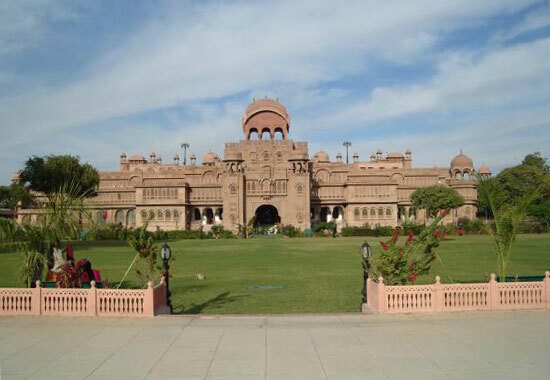 Other parts of the palace have been converted into a museum named as the Sadul Museum to preserve the glory of the yesteryears of Rajasthan in general and Bikaner in particular. Ganga Golden Jubilee Museum is one of the best museums of Rajasthan with some fabulous collection of antiques and artilleries. The Bhandasar Jain Temple, dedicated to the 23rd Jain tirthankara, is also a place worth visiting. The Camel Research Farm carries out breeding and training of camels-the only fighting force and medium of transportation in the past. Bharatpur is a city and newly created municipal corporation in the Indian state of Rajasthan. Located in the Braj region, Bharatpur was once considered to be impregnable and unbeatable. The city is situated 180 km south of India's capital, New Delhi, 178 km from Rajasthan's capital Jaipur, 55 km west of Agra and 34 km from Lord Krishna's birthplace Mathura. It is also the administrative headquarters of Bharatpur District and the headquarters of Bharatpur Division of Rajasthan. 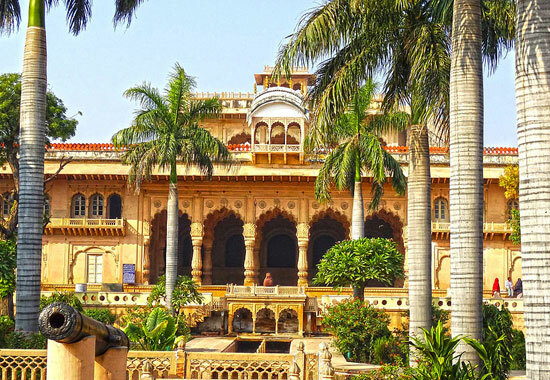 Tourist attractions in Bharatpur : Keoladeo National Park, Lohagarh Fort, Laxman Ji mandir, Ganga mandir, Bankebihari temple, inside Lohagarh Fort, Government Museum, Vishwapriya Shastri Park, Golbagh Palace, Moti Mahal (Bharatpur), Shri Rajendra suri kirti mandir, Kishori Mehal, Laxmi Vilas Palace, Jawahar Burj, Fateh Burj, Nehru Park, Dev Narayan Temple(Sarsena) etc. 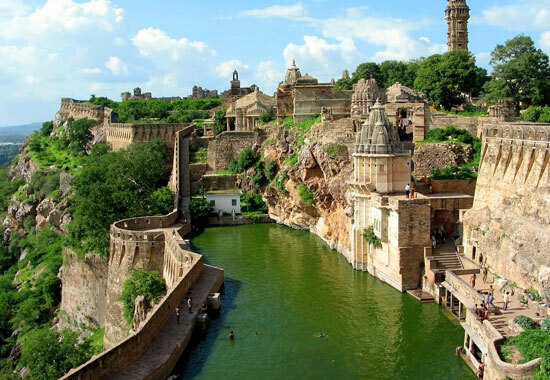 Chittorgarh is a city and a municipality in Rajasthan state of western India. 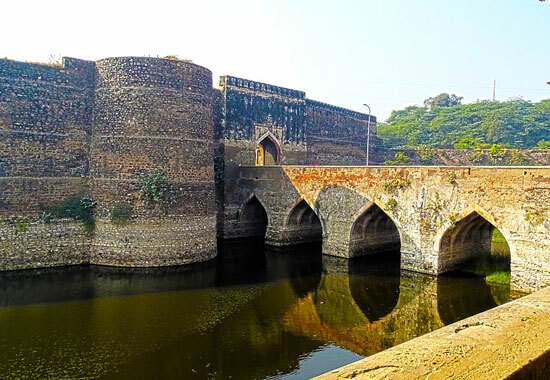 It lies on the Berach River, a tributary of the Banas, and is the administrative headquarters of Chittorgarh District and a former capital of the Sisodia Dynasty of Mewar. The city of Chittaurgarh is located on the banks of river Gambhiri and Berach. Chittorgarh Fort : The Chittorgarh Fort seated on a 180-metre hill, covers an expanse of 700 acres (2.8 km2). It was constructed by the Mauryans in the 7th century AD. There is also a belief that it was constructed by Bhima of the Pancha Pandavas. This fort was the citadel of many great Indian warriors such as Gora, Badal,Rana Kumbha, Maharana Pratap, Jaimal, Patta, etc. Kalika Mata Temple : Kalika Mata Temple was originally built in the 8th century for Sun God and was later converted to a temple for mother Goddess, Kali in the 14th century.During the festival days of Navaratri, fairs are organised and pilgrims from different places come here to pay obeisance at the temple.